South Vietnamese President Ngo Dinh Diem was assassinated on November 2, 1963. 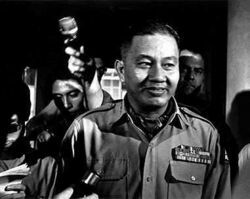 The coup d’etat was orchestrated by the U.S. government and carried out by Duong Van Minh, a former general of South Vietnam. Being the President of South Vietnam is definitely not an easy task. Ngo Dinh Diem faced substantial foreign pressures from other nations, the most obvious push came from the United States. It is without a doubt that President Diem’s odds were not in his favour in opposing America, but there were some actions that he could have taken that may have saved his life. 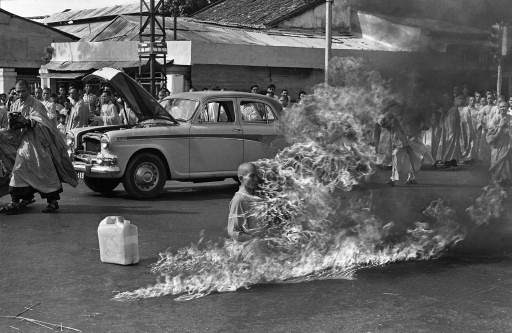 A Buddhist monk protests against discrimination by self-immolation. One mistake that Diem made under his presidency was his discrimination towards Buddhists. Due to his unjust treatment of the Buddhist population, Ngo Dinh Diem had to deal with a large population who strongly opposed his government. As a result, many of the Buddhist population turned to the Vietcong’s side for salvation. Ironically, when the militant population switched sides, they were treated exponentially worse by the North. The reason being that the Communists do not tolerate any form of religion, since religion provided ideas and philosphies contrary to the teachings of Karl Marx and Vladimir Lenin. The Buddhist population could have been a powerful entity to the South. Unfortunately, Ngo Dinh Diem failed to utilize their potential. This discrimination is also the main target of the American media and journalists in the west. Diem’s second critical error is his nepotistic approach in forming his government, giving important posts to his brothers and relatives. His main advisor was Ngo Dinh Nhu, while his brother Ngo Dinh Can was put in charge of Hue, a city located in Central Vietnam. Other government positions were also handed to his family members. Ngo Dinh Nhu was a competent advisor and excellent political strategist; many of his ideas helped keep the Communists at bay. Ngo Dinh Can, on the other hand, was not only incompetent, but made a critical error that arguably contributed to the fall of Diem. Under Can’s command, the Buddhist flag in Hue was taken down and replaced with a Catholic flag, thus alienating the substantial Buddhist population in the city. Can was not an able commander. His appointment, along with some others, caused significant problems for President Diem. Duong Van Minh was responsible for the death of President Diem. The third misstep taken by Diem is his failure to control his American opponents. This step is crucial, but it’s also the most difficult to accomplish. U.S. President John F. Kennedy and the C.I.A. had tremendous influence over many government officials in South Vietnam. President Diem managed to sideline many who opposed him, but failed to take out some of the key players who would later end up being the pawns of the U.S government. The most notable being Duong Van Minh, the former general who had deep hatred for Ngo Dinh Diem and was also a Buddhist. This man would be the key instrument in the C.I.A headed assassination of the first South Vietnamese President. It should be clear by now the three fatal flaws in Ngo Dinh Diem’s policies: the first being religious discrimination, followed by nepotism, and the final is failure to control the staggering American influence in Saigon (although the third factor is more or less out of his hands). If President Diem were careful enough to avoid these dangerously problematic actions, one could argue that his assassination may never have taken place. This entry was posted on May 5, 2010 at 12:04 am and is filed under Modern History with tags Ngo Dinh Diem, South Vietnam, Vietnam War. You can follow any responses to this entry through the RSS 2.0 feed. You can leave a response, or trackback from your own site. The three reasons you stated were the obvious. However, in politics there are other reasons that are not so obvious but still very crucial to the existence of the First Republic of Vietnam and ultimately, the fate President Diem; and one of which was the US’ intention. The Americans realized that they could not control nor manipulate President Diem, so they needed to remove him. The US could not remove him openly or by any legal means because he was installed by the US in the first place. The US had therefore resorted to illegal activities like creating social chaos and division within the South Vietnamese army. The protesting and rioting carried out by buddists headed by Thich Tri Quang as well as the assination carried by General Minh were both instrumented by the US. The US had funded Thich Tri Quang for his actions. In summary, the intention of the US was to collapse the government of President Diem and to replace him with a US puppet. President Diem’s government had enemies on all fronts. The interior enemy of President Diem included Thich Tri Quang and Ho Chi Minh while the exterior enemy was the US. There was only one choice he could have made that may have saved him and his family and that was to take the matter of the country to the People of the South Vietnam and let them decide by referendum – Vietnam with Diem or without Diem. This action would let his enemies know that whatever the outcome, it was the people’s choice and that he will honor the result of the referendum. If he failed in the referendum, he would cease his presidency in an honorable manner and wait for the appropriate time to return to politics if he so desires. If he won, there would be no better voice than this to tell the Americans, Thich Tri Quang and the disgrunted Generals that they best follow the will of the Vietnamese People or face being punished. Not to object what you said but do you have any source to back up the claim that the US was behind Thich Tri Quang. If Ngo Dinh Diem had done all the things that you had suggested, then he would not of been Ngo Dinh Diem. He was a Catholic tyrant who rigged a referendum to come to power.He wanted to shape vietnam to his vision of a Catholic controled vietnam. His government like the Viet Cong oppressed all of those who opposed them. He’s no better then the china loving communist who are in power now.